The report ”Extruded Snacks Market by Type (Potato, Corn, Rice, Tapioca, Mixed Grain, and Others) & by Geography - Global Trends and Forecasts to 2019” defines the extruded snack market and segments it into different types by ingredient and geography with analyses and projections of the market size of each of these segments in terms of value. 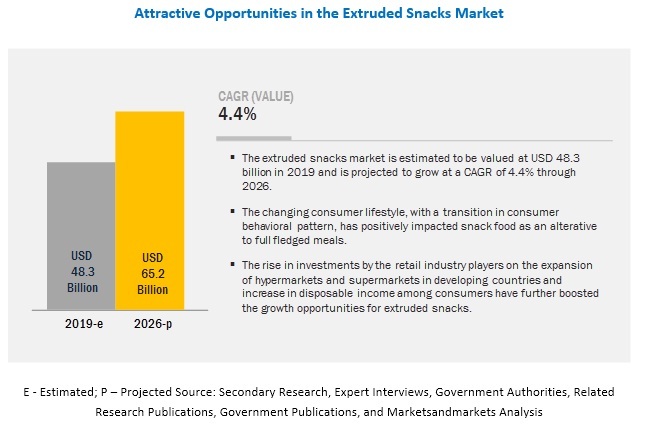 It also identifies the driving and restraining factors for the extruded snacks market with an analyses of the trends, opportunities, burning issues, and winning imperatives. Browse more than 95 market data tables with 37 figures spread through 212 pages and in-depth TOC on "Extruded Snacks Market by Type (Potato, Corn, Rice, Tapioca, Mixed Grain, and Others) & by Geography - Global Trends and Forecasts to 2019"
The extruded snack market is driven by the consumption habits of the consumers, marketing strategies of the companies & attractive packaging, pricing strategy, and the developing economies. The key market players adopt new product launches and expansions as their preferred strategy to sustain the competition in the market. The different ingredients used to manufacture extruded snacks and an introduction of a wide range of flavors of extruded snacks has further driven the market. The extruded snacks market is estimated to reach about $31 billion by 2019. In 2013, Asia-Pacific was the largest extruded snacks market and is estimated to grow at the highest CAGR from 2014 to 2019. The Indian market for extruded snacks is projected to grow at the highest CAGR of more than 12% from 2014 to 2019. The Latin American market is estimated to be the second fastest growing market. The report includes the marketing and development strategies, along with the product portfolio of leading companies. The report includes the company profiles of the leading companies such as Frito-Lay North America, Inc. (U.S.), Calbee, Inc. (Japan), and Grupo Bimbo, S.A.B. De C. V. (Mexico). The key players in the market are persistent in the expansion of extruded snacks offerings to new markets and are actively investing in R&D activities to gain a competitive edge through new product developments.